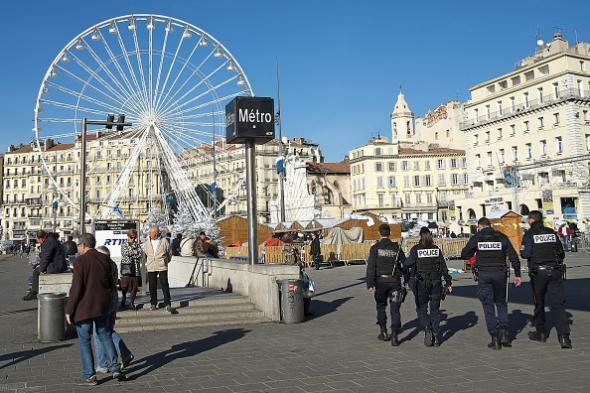 Jewish man stabbed in Marseilles by ISIS supporters, prosecutor said. Police on patrol in Marseille on Tuesday. Three people on two scooters, one of them wearing an Islamic State t-shirt, approached the teacher in the street, Marseilles prosecutor Brice Robin told Reuters … “The three people insulted, threatened and then stabbed their victim in the arm and leg. They were interrupted by the arrival of a car and fled,” Robin added. Jews were also targeted by the Jan. 9, 2015 attack on a kosher Paris supermarket in which an ISIS-affiliated gunman killed four people. The historically anti-Semitic National Front party, meanwhile, has recently been gaining a great deal of support among voters concerned about the perceived threat of Muslim immigration; the party was expected to do well in upcoming elections even before the Nov. 13 Paris attacks.